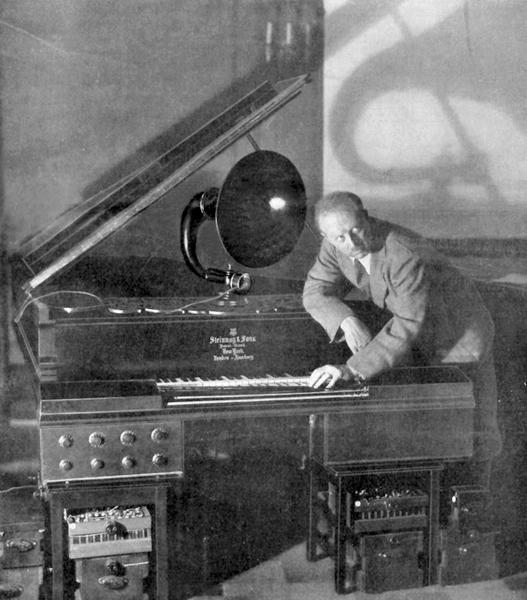 The Hellertion,christened after the combination of the inventors names, was a monophonic vacuum tube instrument developed collaboratively by Peter Lertes, an electrical engineer in Leipzig and Bruno Helberger from Frankfurt, a well known pianist of his time. Several variants of the instrument were constructed with the assistance of Schneider-Opel in Frankfurt, Germany the last of which was known as the Heliophon. 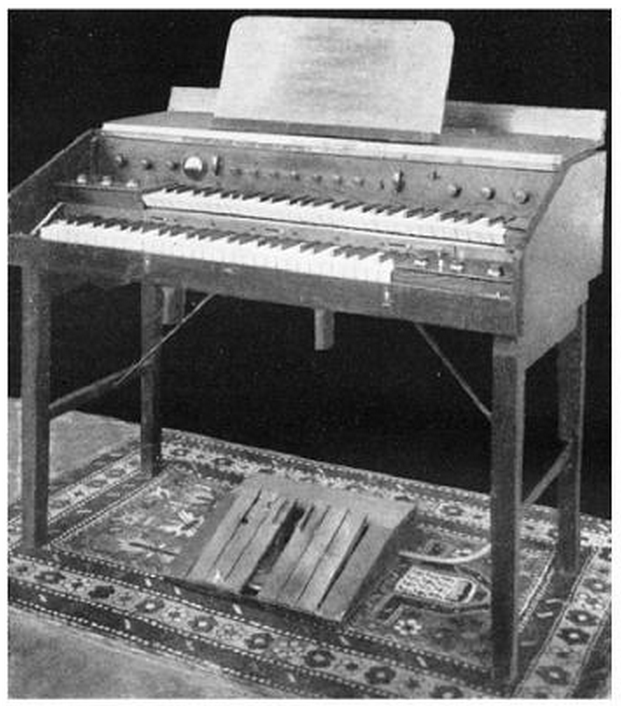 The Hellertion was the first electronic instruments to use a fingerboard/continuous controller instead of a keyboard manual and was much copied in other later instrument designs such as the Trautonium and the Sonar. The fingerboard was a flat metal resistance strip covered in leather which when pressed completed a circuit. Depending on where the strip is pressed, a different resistance in the circuit is created altering the voltage sent to the oscillator and thereby producing different pitches. The force of the pressure controlled the volume of the output signal. The fingerboard was marked to help the performer find the correct pitch on the strip and had a range of approximately five octaves. The original instrument had just one fingerboard strip which was gradually increased to four and then on the later models, six aligned in parallel horizontally at the height of a piano keyboard. The four and six strip models allowed four and six voice polyphony when the strip could be played simultaneously with fingers and thumbs. The Hellertion was occasionally used in concerts as a piano addition, the melody being played with one hand on the Hellertion and the accompaniment being played with the other hand on the piano. A version of the Hellertion was produced in 1931 microtonally tuned to 10 divisions of an octave. Diagram showing the sliding control of an early model of the Hellertion. development of the Hellertion by Bruno Hellberger. The first version of the Heliophon was completed in Berlin, 1936 but destroyed during WW2. Hellberger continued the development after the war and built a second model in 1947 in Vienna, Austria and continued the development of the Heliophon until his death in Vienna in 1951 (subsequent development was taken over by Woflgang Wehrmann). 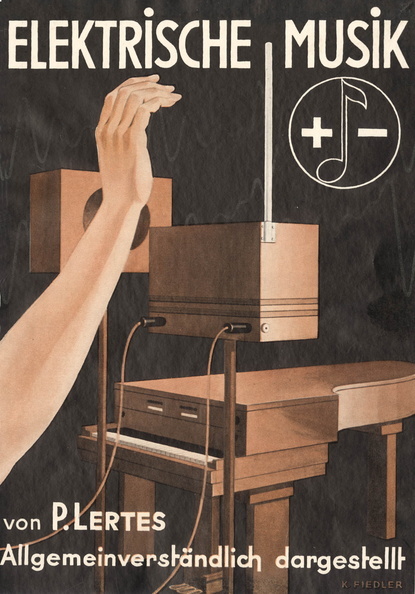 The sound of Heliophon was produced, as with the Hellertion, by heterodyning vacuum tube oscillators but with the Heliophon the sound was controlled by two 58 note pressure sensitive keyboard manuals instead of a series of fingerboard strips. 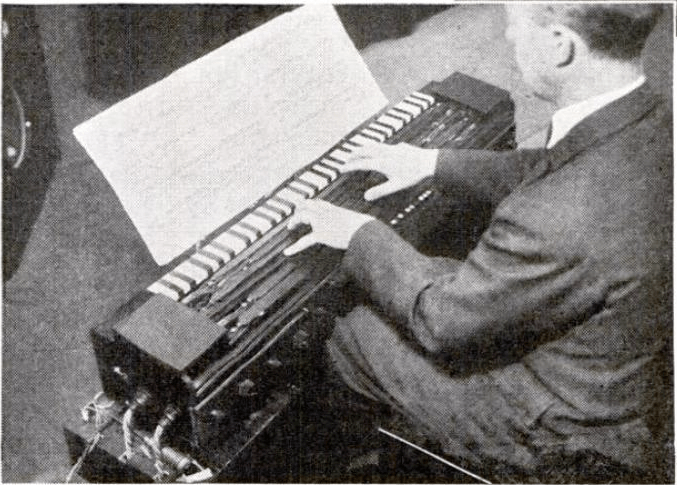 Each keyboard had the ability to be split into three different pitches and timbres simultaneously, the output volume being controlled by foot pedals with a knee lever to add vibrato. 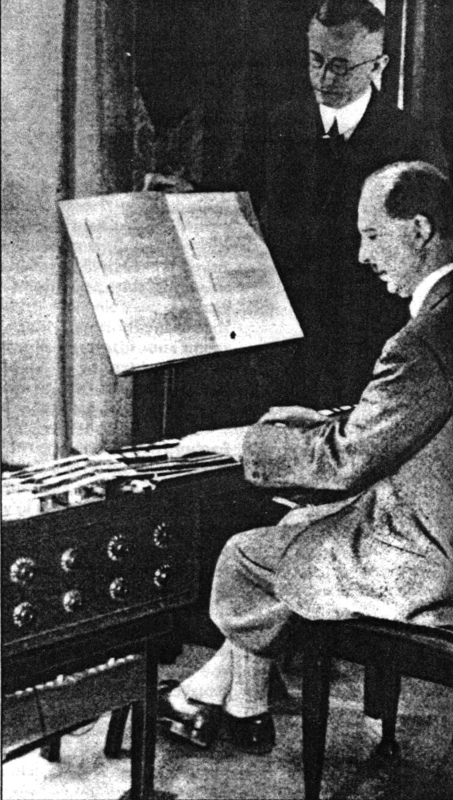 Each keyboard had a Hellertion style fingerboard to add glissando and timbre variations.The Heliophon was used by Hellberger throughout the 1940’s and 50’s for theatrical and musical productions, the instrument was said not only to be capable of producing realistic imitations of orchestral instruments but able to imitate human vocal sounds. 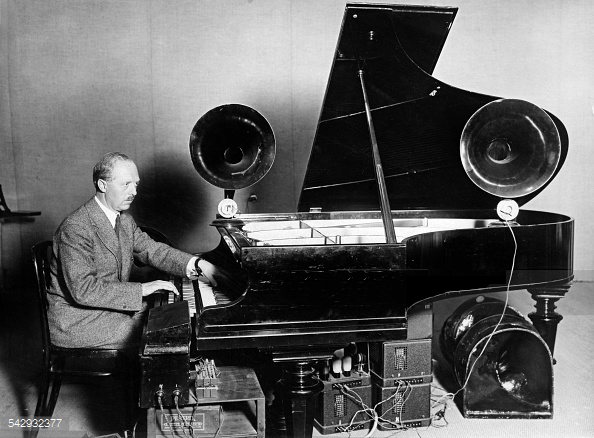 Bruno Helberger and the Hellertion as a Grand Piano attachment.